Changing cat food needs to be done gradually for the good health of your cat or kitten. Your kitty's digestive system has certain enzymes and bacteria that need time to adapt to the new food. A sudden change in diet can lead to digestive problems such as diarrhea or vomiting. Your feline friend may also go on a hunger strike if she doesn't like the new food. Don't harm your cat by insisting that she eat what's in front of her or go hungry. If you're in a situation where you must immediately stop serving the current food, (e.g., due to another recall), then you might want to have a couple of different brands on hand. That way you can try another choice if it appears your kitty is not interested in the first choice new food. You should never change your cat's diet for a health problem without consulting your trusted veterinarian first. Expert sources vary on their advice about changing cat food and how long it should take, but they all agree on one thing: it should be done slowly. It can take from 3 or 4 days up to 10 days to completely change over to the new food. If you are flexible about the timing, a longer period of adjustment may be best. If you know your cat's has a sensitive stomach, you could even take two to three weeks to completely make the transition. And if your cat is the type with an iron stomach who'll eat anything in sight, changing cat food slowly is still a good idea. This allows time for your kitty's digestive system to adapt. To start changing cat food, mix a small amount of the new food in with your cat's regular meal. Over the next week or so, gradually add more of the new food until you are serving all new food. Some cats may take a little longer than others. If you know your kitty has a sensitive stomach, use the first guideline. If you think it won't be a problem, then use the second guideline. You can also modify the two schedules and speed up (but just a little) or slow down as your kitty's digestive system dictates. Be patient and flexible and take your cat's lead. The above percentages are just guidelines. Follow your cat's lead and use your judgment about how it's going. If your kitty starts to experience any digestive problems, go back to the mixed amount you were feeding before the upset started happening and stay there for a day or two before moving on to the next percentages of old and new food. 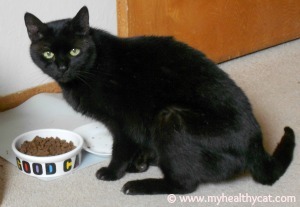 Choosing the Best Cat Food - How to choose the best cat food for your healthy cat or kitten. Life's Abundance is my #1 recommendation for the best cat food online (or anywhere!). This is what I feed my healthy cat. She loves it and I feel confident that she is getting the best possible feline nutrition.